Michael Murphy, Trustee Emeritus of the Bach Festival Society (Winter Park, FL), introduces us to Paul Moravec’s newest choral work which premieres on April 16 and 17. Music, Awake! was commissioned by the ensemble’s board of directors to celebrate music director John Sinclair’s 25th anniversary. 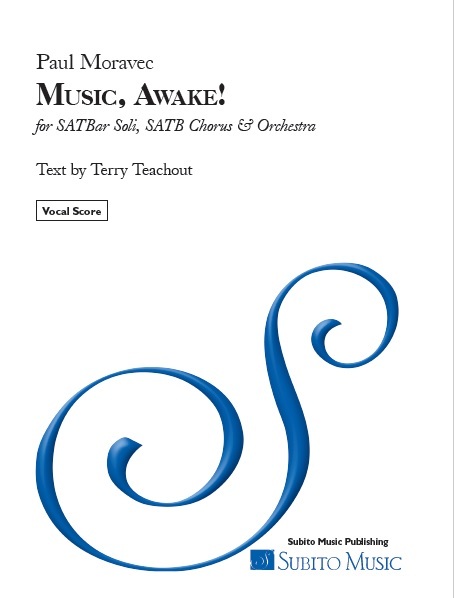 The nine-minute, six-movement work for soloists, chorus and orchestra features an English libretto by longtime Moravec-collaborator Terry Teachout. Director Elizabeth Gwinn adds her thoughts. “Music, Awake! is the Central Florida region’s first commission from a Pulitzer Prize-winning composer. We couldn’t be more thrilled with both Paul and Terry’s work in helping us honor Dr. Sinclair. A commission by these artists helps position the Bach Festival Society as a serious player in choral music. After its world premiere, Music, Awake! will be recorded by Bach Festival Choir and Orchestra and released in 2017 with Bach Festival Society recordings of two other unrecorded Moravec works: Spirit and Songs of Love and War. Upcoming: Moravec’s next world premieres takes place on May 7, when the Minnesota Opera presents the composer’s new opera The Shining (written in collaboration with librettist Mark Campbell) featuring stage direction by Eric Simonson and conducted by Michael Christie.